How many pincushions do you have? Can you count them? Do you ever have enough? NO!!! They can always be considered a COLLECTION! If you want to win Kathy’s new book shown here she has graciously given us one to give-away! Tell me how many pincushions you have in your collection so far… and you will be eligible to win this book of pincushions…You have 3 days until June 20th to comment before we pick the winner! I hope you visit Kathy’s site and see all her other creations…she truly is a talented artist and a good person! Next Post Cathy’ pincushion book winner is…..
I’m a new quilter. So far only two pin cushions! Can’t wait to add to my collection! Weellllllllll, I don’t have a collection – yet. I use one pincushion. Think I should start a collection??? I think I have 7. That is if you don’t count the arm of the couch or my pantleg when I don’t have one handy….sounds like I need to make a few more huh?! Nine so far but I’m a sucker for a cute pin cushion!! I have 18 pincushions in my collection – but the only one I actually USE is a magnetic one that I keep by my sewing machine – the rest are just for making my studio look fun! LOL I love her designs and it would be so fun to win her new book and make some of them…. I have 8 pincushions… All given to me by friends. I need this book soIcanpay them back! HELLO! I HAVE SO MANY PIN CUSHIONS,SOME CUTE,SOME NOT SO. SOMETIMES I MAKE A PRACTICE BLOCK THAT TURNS INTO A USEFUL PINCUSHION TOO. I THINK I HAVE QUITE A FASCINATION FOR PINCUSHIONS ACTUALLY AND THIS BOOK SOUNDS SO NEAT! I have four handmade ones of my own, but have made many,many more to give away! They are the perfect hostess gift, birthday gift, Christmas gift and just-for-no-reason gift for my sewing AND non-sewing friends and relatives. I try to make one that fits the receivers personality and everybody needs a pretty pincushion! I would love to win the book with even more ideas! I have I have 8 pincushions, but really only use 1 of them. Right now I only have about 6 pin cushions but I have wool and other UFO’s for at least another 6. I only have 4, but I have a great love of them and I could certainly see a collection in my future. I have 4 pincushions. I looking forward to making many more. I have several packages of crushed walnut shells just ready to be put inside ! I have 7 pin cushions, all styles it seems. We use crushed hazelnut shells here for filler. I love my pincushions and they all get used! 2 – I’m a beginner collector. One is store bought and one homemade. 🙂 I keep eyeing new ones to create. Would love some inspiration. Enjoying your blog. I made the cutest owl pin cushion from wool and the other night my new dog got it and put a hole in it. This just made me sick. I guess I need to make some more. Love wool. I have 4 pin cushions which include a vintage “tomato” with the strawberry shaped needle sharp, a primitive counted thread that I made last year and a wrist cushion that works great unless I miss the cushion. But my most prized is a shoe- shaped, heavily beaded pin cushion made by my great,great Grandmother who was famous for her award winning quilts, 2 of which I have inherited. I have a couple– and can never find them. I definitely could use this! Hihi,I have more than 15 pincushions…can’t have enough of them!! I have 8 pincushions so far. Some I’ve made, a couple are from swaps, and one a friend made for me. The wool ones are my favorites! I’m thinking about 10 pin cushions, however that doesn’t include all those I’ve pinned on my pincushion board on Pinterest. In my heart I count those as mine too. I estimate that I have about 50 pincushions because I just can’t resist a cute one, especially one that’s different than any I have, and well to be honest they just make sewing and quilting more fun. I love to sit down with handwork and a cute pincushion. I’d love to have her book to make some for our quilt show and quilty friends. I have one wool pin cushion (Primitive Gatherings kit, of course) and three magnetic plastic ones. Great book!!!! Would love it. I probably have 20 or so, but you never have enough! These are too cute! I only have 2! I have made more but keep giving them away as gifts! I need to keep some for myself. I’d love to have this book to make more. I have 5, but lots of scraps to make more. Is two considered a collection? I only have one but that’s because I keep making them and then end up giving them away. Would love to have this book as it would give me more ideas for more pin cushions that I would probably end up giving away. Maybe I could keep a couple for myself…..lol. Hmmm, I think I have about 5 pincushions…but would like so many more, tee hee. Thanks for the chance to win th book! I can count mine on one hand. I have four, one of which I just made a couple of days ago. I surely need lots more, I would love to win the book. Thanks for the chance. Oh my gosh!!!! Pin cushions are one of my weaknesses!!! I love them. I probably have 5 that I use all the time…. I have lots of different work stations! LOL And…. maybe 5 that are used for display! Please enter me in the wonderful drawing!!! My friend Nancy made me a pincushion in 1988. It is the one that has a little thread catcher connected with velcro straps…and holds on to the table with a hidden tile…..She made it after all my kids were in school, and she wanted to entice me back into quilting….she placed a note in it with $20.00. We made a date to go to the quilt shop to go buy some fabric….That’s back when $20.00 would buy a few yards of fabric….Great memory….PINCUSHIONS…smile………. I love pincushions. I have 30 pincushions. Some have been given to me by friends and some I have made and others I have bought. The book looks great. Thank you for the chance to win a book. I recently saw some of the designs in this book online–Love them!! Striving for an even dozen — there are nine in my collection at the moment. A quilter/stitcher can never have TOO many! I only have 4 pincushions but would love to make a few additional ones to add to my collection and for my friends. They look wonderful. It is so nice of you to promote other designers Would love to win Kathy’s book! I probably have about 10 pincushions! I’d love to win this book – it looks wonderful. I only have six along with a couple of magnetic bowls. I am gravitating more to the wool ones so have started a collection of wool thinking the embroidery would make a good project for riding in the car. This book would help. Thanks for the opportunity. I have five pincushions and would love to make more. Thanks for the chance. I have 8 -three are store bought and the rest I made myself. Would love to win this book. I have 3 pincushions and a magnetic pin dish! I have only 4, but they are special. One from a friend who moved away, one from Hawaii, and two from Sisters, Oregon outdoor quilt show. I haven’t made my own and would live to win this book and get started. It would put a dent in my wool pack-of-the month collection! 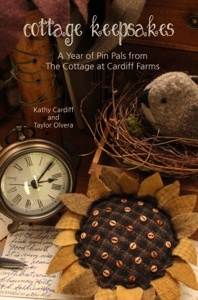 When I saw the sunflower pincushion awhile ago I asked Kathy is she was going to do a book and here it is. It’s wonderful. I love pincushions and look forward to seeing her book. I would love to win her book. I have one pincushion – made by my dear daughter! I would love to be able to make her one! I don’t happen to have any pincushions. Guess I should join the BOM so I can fix that! I have 5 or 6. Most we’re given to me. The last pin cushion I made I gave to a friend. I love cute pincushions though! I only have six so I NEED sew many more….this would be a great to win. Thanks Kathie for designing and Lisa for doing this! Too many to keep track of, but my favorite one is a very fine crocheted top, stuffed with my great grandmothers hair. I have 7 pincushions and I love all of them but I can’t wait to make the one’s in Kathie’s book! They are GREAT! When does the BOM start? Oh, to win Kathy’s book would be wonderful, looking forward to pincushion offering. I have two in use that I use for different pin types but a number of redundant ones now adopted into other roles, e.g. mushrooms now in my forest Christmas decoration collection, two little birdhouse ones I use to decorate at Easter and my pumpkin for Halloween. My baby shoes (adapted into a pin cushion) will always stay with me on my sewing table though. I tend to use my favorite…a black crow, but I do have several others (some in the cut out stage, some in the stuffings take and a couple in my plans to do. Finished six. I have 2, but I think it’s time to get this book and start a true collection! I only have 9 at the moment, I am glad to hear that I can say I am really “collecting” these, as I do not use them. Pincushions are so much fun to make that it is hard to say enough! This looks like a fabulous book. I have about 8, but would really like more! For me, pin cushions are kind do like fat quarters, never enough. I would love the new book. Thanks Lisa for introducing us to Kathy. I have 13 and that’s just unlucky, so I’d love to win the book and make one asap to revise that number! I love pincushions. I love making pincushions. I have so far made 14 of them. different styles. All kept in a wire/wicker basket I got at a flea market. Can’t wait for the BOM for pincushions. I probably have at least 25 pincushions. A few are utilitarian but most are for show and are made of wool including a few Primitive Gathering ones. Obviously I would love to win this book…..thanks for the chance! book are so cute, that I think I need to start a collection! Congratulations to Nancy for winning the Heart to Hand pattern. Lucky girl! I have 2 pincushions. One is handmade. This looks like a very cute book. You can never have enough! Only about 10 right now (not counting the patterns to be made!). Would love to win the book and increase my ‘collection’. Well, I went to count and I surprised myself, looks like I have 19, I use them all. They are spread throughout the house, most are in my sewing room. My husband thinks I am crazy every time I make another or buy one. Love all of the ones on the cover, can’t wait until you offer them as BOM. I have only been doing the wool for a year and half and have 12 pincushions. If I had been doing a pincushion a month I would have 18, so I’m 6 short. Love them all and would love to have the book. I presently have 12 completed ones in my collection…6 more in the works. I love them…they are among my favorite things! I have 7! I am a sucker for cute ones. My husband is always so glad when I use them instead of the arm of the couch. I have 12 so far. There are at least eight in the sewing “room” some that were my Grandmother’s and those that have been added by me along the way…. I have 11 (5 are vintage) so far and patterrns to make 6 more. Would love this book. I love pincushions and have just started my collection. I have about 10 now but would love more so please pick me!! I can’t help myself from making pincushions for myself and friends, so much fun! Will definitely put this book on my wish list! Right now I have 36 pincushions and the number keeps growing. Pincushions are a wonderful collectible….I have 14 that I can find, but would love to make more! well since I can’t even find them all I obviously need more!!!!! Adorable!!! Only two for me, three if you count the cushy arm of my lazy girl chair! I have 13 so far. Love to make them. I know I will be signing up for the block of the month. I need a pincushion with each project I’m working on— I have a lot of things going at one time– sticthing, binding, embordery , sewing , quilting, traveling kit and some to look pretty. I do believe new pincushions inspire me to finish my projects. I only have 3 that I have made but there are so many cute ones out there that I see more in my near future. I love pincushions! I just counted 54 in my sewing room. I love to make them!! I have about 15 pincushions, working on 3 new ones and about 12 patterns waiting to be made. Her patterns look adorable! I am the lucky recipient of 3 pincushions – all three gifted to me by my “sisters” in our Stitching Hive!! Kathy’s book looks great and I would love to win it!! m(I’m way behing on gifting my Stitching Sisters! I have 4 pincushions, but more is always better! Thanks for the chance to win the nice looking book! I think I have 6 now, but I am always looking for more unique ones. Thanks for sharing and for the opportunity on the draw. I only have 3 pincushions, but I love them. I’ve been making them for friends out of Homespun Fabric with Wool Flowers. I would love to try some new patterns. My oldest granddaughter would love the sunflower one – maybe then I could get her to start sewing. Oh I only have 5 pin cushions……isn’t that an adorable book and what a clever idea! I must sadly say that I only have one pincushion. I love all that I see, just no time to make any for myself. I only have about 4 pin cushions. I’m sure I need more! I think I have 5 and they were all gifts. Well, I guess I’ll tell it like it is. I grew up when the only pin cushion around was the (dare I say “unattractive”) red tomato pin cushion. When I saw the lovely, prim sunflower pin cushion on the cover of Kathy’s book it spoke to me…loudly! I would love to make that pin cushion…and I would even use it! You shouldn’t award me the prize because of how many pin cushions I have, but because of how many I don’t have. I have 0 (zero, zip, nada) pin cushions! Because of those old red tomato things, I have put my pins in clear plastic boxes and they are screaming to get out. From a position of lack, not abundance, please consider the plea of my straight pins…they’re keeping me up at night with their mournful cries. I only have about 3 myself, but some I’ve given away. I do plan on making lots more! I love all of my pincushions………..and I also have a collection of thimbles. Each and every one tells a story and means the world to me. I have 7 so far but plans to make many more… love to give them as gifts too! Apparently I do not have enough pincushions! I only have 7 and I suppose I need more! Thanks for the opportunity. I currently have about 25 and consider myself a collector, but 90% of mine were made my me. I love trying a new pattern or a new challenge. I have 2 pincushions. I would love to make some cute ones to start a collection! LOVE her little pin cushions! I have one pincushion given to me by friends and I purchased a primitive gatherings kit to make as a gift for my Aunt. The book would be a great addition to start my pincushion collection. I have 11 treasured pin cushions. I made some as small projects at our quilt guild. A very close and dear friend made one for me. They are so much fun; they put a smile on my face. I can’t wait to make more for my collection. I have 3 but would love to add to my collection. I have 4 pin cushions that were gifts, 2 are hand made. I would love to win this book. Thanks for the chance! I have maybe 4 pincushions. I love the idea of doing a BOM with pincusions. Her book looks like it is fabulous. I’d LOVE to win Kathy’s new book! I could make another pin cushion to add to my “collection” of 13 already in my sewing room! I’d LOVE to win Kathy’s new book! Then I could make another pin cushion to add to my “collection” of 13! I have several pin cushions, guess I’ve never counted. There are some I use and some are just fun to have. Do unfinished ones count? I have 16 and about 4 unfinished ones, Can’t get enough, they make the best “Little” projects to sew inbetween those quilt projects. Love, Love, Love PINCUSHIONS! PS I don’t have any like Kathy’s so I would need them in my quilting room. I have a lot! They have become my new favorite thing to make. Probably 10. I sadly only have one! I would love to win to start my own collection! Will check out her site immediately! That are sooooo cute!! I currently have 22 pincushions!!! Two of the groups I belong to exchange them at Christmas time! I LOVE them all and can’t wait to collect more. 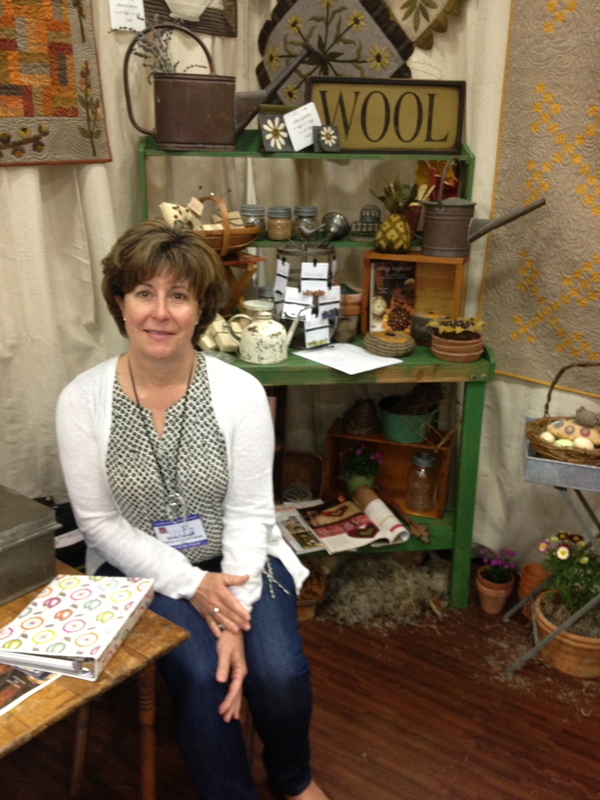 I saw Kathy at the Country Loft last weekend….she was teaching a pincushion class from her book. I’d love to own this book! I only have two pin cushions and a magnetic pin tray (which isn’t very cute). I could really use this book! I only have 3 pin cushions (2 from Primitive Gatherings). I love these little projects that are quick & creative inspirations. Little Pinnies are satisfying feeling of accomplishment plus add to the creative decor that surrounds a quilter’s house… Also make great gifts! I have 24 pincushions in my collection so far! Always room for more! I’ve got 5 or 6 but would love to increase that number with these cute patterns! I have 4 pincushions but have made several for my friends-this book is really great and would love the chance to win! I only have 2 pincushions – the red tomato and a wool handmade one that was a gift from my dear friend. Time for me to begin a collection! Ah, so I’m not the only one with the addiction!?! I am lucky enough to live in San Diego and have been taking Kathy’s classes for several years, I did the pin keep for many months and have quite a collection, I also did her wool mat of the month, she is a great teacher and a talented person, kind and generous, just like you Lisa. I was also fortunate to take a class from you several years ago, it was when you picked up Jeter and Elvis. I recommend this book. I think I have upwards of 20-25. I adore pincushions and have several that are antique. –I have about 17, and enough patterns for about 30 more! I have them all over the house and in every sewing bag and basket. Several are grouped together on my treadle machine in the living room. One very treasured one is a knitted cushion that has 5 or 6 gradually enlarged double “rings”. It was in my mom’s knitting basket for years, and I received it when she died . It holds several pointy tools, a thimble, bobbins stacked on a crochet hook , my drafting pencil, sewing machine brush, and, of course, pins. One can never have too many sewing tools or pin cushions! Appreciate all your inspiration! I imagine I have about a dozen pin cushions. Probably have about half a dozen books about making pin cushions too. What fun. I love making any type and often given them as gifts. Would love to win the terrific new book. It looks wonderful. Just one “good one” And it is a bird one from Primitive Gatherings. 🙂 I’d say I need to make some more. One can never have too many pincushions, in my opinion. My husband claims he is a human pincushion, or magnet, as he has picked up several pins/needles with his feet. Ouch! I have plenty of the standard red tomato ones. I have made several-mostly calico chickens, but my favorite, so far, is an antique one my grandmother gave me many years ago from her “variety store” in New Orleans, La, It is a china shoe with a red velvet cushion filled with many rusty pins. Just for show, of course. Reminds me of her everytime I look at it. 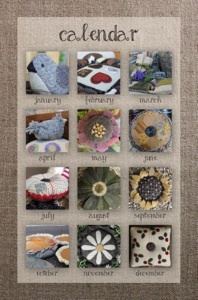 I would love to have this new pincushion book, so I could add to my collection. I am constantly looking for little odd shaped glass/ceramic items to make unsual pincushions. Thank-you. I only have 1 pincushion but last year I made each of my 13 friends a pin cushion from the summer gathering book! It was fun and even the friends that don’t sew loved them! I loved making them. So far only 4. But one of them is my very first pincushion from when I started sewing – over 50 years ago! I do think it’s time for something new. Thanks for the opportunity to win. I have 7 one of which was my Grandmothers. She had it hanging by her treadle machine which I have. If living she would be around 120. I just LOVE pincushions! I also love to do wool work, so this book is a must for me! If I don’t win it, I will be purchasing it the next time I am in Primitive Gatherings :-). My “collection” is 16 strong right now, but there is always room for more! I have three pincushions which were all gifts ~ not counting whatever shirt I have on that day. I’ve been known to have needles and pins hanging from me when out in public! (much to the embarrassment of my girls! I have 3 pincushions which were all gifts ~ not counting whatever shirt I am wearing at the time. I’ve been known to be in public with threaded needles and pins hanging from me ~ much to the embarrassment of my girls. I counted 11…there might be a few more, but I can’t put my hands on them at the moment. would love love love to win the book! I have (that I can think of) 7. Love them, have several of them in my mind that I would like to make. Wish me luck. I have 3 pin cushions. One of the tomato style ones, one of the magnetic ones and one that I charish from my husbands maternal grandmother that is a little ceramic shoe with stuffing and a terry cover. Maybe if I win this book it will inspire me to start a collection!! I started making pincushions after seeing all the wonderful ones on the internet. I saw Kathy’s delightful sunflower and wanted to make it. I wrote her to see if she was going to do a book and wala she did. I have a very large collection of pinkeepers and make-do’s, probably close to a hundred. I have one with all my various projects. I have been waiting for Kathy to publish her book and I would love to win her book so I could add to my collection. Patricia Roberts of Ohio. Whew! At least I’m not alone with my obsession! A quick trip to my sewing room clarified my count at 13 finished and 2 in the works. Thanks for the introduction to Kathy. I WOULD LOVE THIS BOOK! I probably have about 15 – love to do pincushion exchanges. This book looks like the ticket and I think a BOW would be fun fun! You are so generous with your time to inspire us. Thank you. Pin cushions; there are about a dozen, a few quite old and some I have made. I only have 3, but I’m always looking for pins and those pincushions are just never in the right place when i need them! Need to make some more. Maybe 13. If I can’t find a pin when I need it, I make another one. I currently have 6 pincushions, and I use each of them. As you can see I have room for more. Thanks for a chance. I might have a zillion, but I don’t really know because I try not to count my favorite things. I would have to say that this little pattern book fits in 3 categories of things I don’t seem to have enough of: pincushions, patterns/pattern books, and calendars. I haven’t started using my toes to count but pin cushions are the sweetest things. Let the collection begin! I have 17 pincushions and want at least 17 more. Many of my friends (we’re called the Old Crows) also have collections and I love to give them as gifts. Would love the book!!!! I have at least 6 different ones that I can think of…..so there are probably more. One of my favs is a tiny chick made by one of my quilting buddies….so stinkin’ cute! I counted 27, but might have missed one or two. Love pincushions and cant wait to have this book of them! I found 10 pincushions, but there are probably more hiding around the house. Can’t seem to get enough of them. If I can remember correctly, I have 5.. Thanks for sharing info / other designers that we might otherwise not find out about! I have one old faithful pink velvet tomato pincushion with marching strawberry needle cushion. So I could really use this book! I have made a couple plain red velvet ones for gifts. I know of 13 pincushions off the top of my head. Now if kits that are not finished yet count then there could be 5 or 6 more. I have printed off patterns for even more that some day I will take the time to stitch together. If you have not guessed I reallllllllly like pincushions. I have 10 and my favorite so far is the big watermelon one that is pieced with dark red fabrics. I have an accidental collection of pin cushions that began many years ago with a beautiful porcelain and velvet pin box/cushion from Scotland. I now have about a dozen but my current favorite is a little ball of wool in an acorn shell that I use for tiny applique pins on portable woool projects. My husband told me not to forget his two feet in the count. Why is it whenever a pin hits the floor the only way to find it is to have your husband walk by? I only have one pin cushion!! And I definitely need more!! I only have one! But would love to make some more….they look really country beautiful! Thank you for highlighting other designers for us to get more ideas from to add to our learning process! I have approximately 5 hand made pin cushions and one magnetic (used for traveling). One of my quilting friends and I made 15 Frog pin cushions with legs for a quilt retreat. The other quilters loved them. We stuffed them with wood shavings from my dear hubby’s wood working shop. Love to get some new ideas! I believe I have 6….but always looking for more! I have 2 wool pincushions from your shop. I would like more to place around my rooms to use and decorate with. The book looks fab!!! Mercy! The one and only pin cushion I have is the strawberry…blah…blah…blah! It’s good luck and I can’t part with it, but would like to add on. Thank you. I love Kathy’s creations for Cardiff Farms and this new book is no exception! I am new to quilting and only have made 1 pincushion, but am eager to make more! I love the sunflower pin cushion. I only have three pin cushion. I have six pincushions and they all have a special memory. Would love to make some for stocking stuffers this Christmas! Seven, I think! I have made some and given them away. A cute pincushion just makes a person smile….but of course so does that tattered tomato (very worn and not so cute) that bring to mind memories of my Grandma. Thanks for the opportunity. I am enjoying the market highlights. I can count 10 pin cushions that I have in my ‘collection’…….there can never be too many! I love all the different patterns out there for these fun creations! Thanks for sharing! I have about 20 in my collection. Some were given to me as gifts others I’ve purchased because they were just to cute. I have 2 pin cushions. One my grandmother gave me when I was 8 and one my husband’s grandmother gave me about 10 years ago. I really need to add to my collection! Keeping my fingers crossed. Thank you. Pans so I will soon have more! I have about 25 pincushion in my collection, but probably have made another 25 for my family and friends. You can never have too many, I love making and collecting them. Would LOVE to have more! I have several because I scatter them everywhere ! I think they make the greatest gifts so, I would love to win the inspiring book !! Thank you for the chance from beautiful Northern CA. !! Six and obviously I need more. Would love to win this book. One cannot have too many of anything when it comes to sewing and wool items. Thanks for sharing a designer in your blog…love meeting new people. I have none, so far, but have been thinking of making some. I don’t know the exact number of pin cushions that I own, but there are enough to call it a collection, yet a small enough number to enjoy seeing them each day in my quilt room. I have a few but would love to add these to my sewing room! Thank you! I have only 3 pincushions. Obviously I need this book. Thanks so much for the chance to win. So many cute pincushions, great gifts for friends. Believe it or not, I have 27, but several of those were my Mom’s and Gram’s. Treasures that their hands touched each day that I could not bare to part with. Pincushions can speak volumes. I have about 74 pin cushions. I’ve been collecting them for many many years. Most are priceless as the were given to me from my grandmother. She started me out with sewing when I was in the 5th grade, im 46 now, and its something I still do to this day, all because she left me with a special gift. Sewing, machine and hand, is my passion. I need this book so that I can add more to my collection!! I have more than 3 dozen. Only three of them are full of pins, the rest are displayed around my work area. I have 8…many hand made and definately used every day! But I can definately add a few more and the ones from this book look wonderful, Keeping my fingers crossed. I have an accidental collection of 7 unique pincushions including the original tomato from my “home economics” class in high school! My husband insists that I also count his two feet which would bring it up to 9. Why is it the only way to find a fallen pin is to have your husband walk by in socks? Never enough! I have four pincushions but never in the right place. I’m always fascinated by the cute pincushions at the shops and shows but am intimidated about making them, especially stuffing and finishing them. Time to tame this fear and make a few fun and practical gifts for me and my friends. They’ll be delighted! What fun! I have 8 pin cushions. Some old and some new! The book looks great and I would be a happy person to win it! I don’t have any pretty or unusual pincushions, only functual. I would love to have the book to make pincushions for gifts. What a special reminder of friendship to give to special people. They already know how much sewing has always meant to me. A small way of sharing that love. I have made three log cabin quilts. The first one I even hand quilted for my Aunts 60 th birthday. I believe the log cabin block is one of my favorites! yet effective. A lot of times it’s difficult to get that “perfect balance” between usability and appearance. I must say you have done a very good job with this. In addition, the blog loads very fast for me on Opera. Superb Blog!